In 2004, children's book writer and illustrator Grace Lin asked many of her fellow illustrators to paint illustrations on wooden snowflakes, which would then be auctioned off as a fundraiser for the Dana-Farber Cancer Institute in Massachusetts. The event was called "Robert's Snow" after Grace's husband Robert Mercer, who suffered from bone cancer (full story here). The auction raised over $100,000 for the DFCI, and since then "Robert's Snow" has become a nigh-annual celebration of beauty, community, and hope, in the face of a monster that seems to touch nearly everyone. Now, in a massive feat of organizational elan, Jules at Seven-Imp has coordinated the children's book bloggers community to display all 200-plus snowflakes for the 2007 edition over the next several weeks, leading up to the online auctions of said snowflakes from November 19-December 7. You can see the Week 1 schedule of blogger features here, and -- more importantly -- see and bid on the snowflakes themselves HERE, starting November 19! Besides the fact that one hundred percent of the proceeds go to fight cancer, they are things of beauty and joys forever, and they make perfect holiday gifts for your favorite children's book lover, writer, illustrator, librarian, or editor (ahem, ahem, friends and family). I'm honored to be part of the bloggers' effort by featuring the work of Selina Alko. As her official biography states: "Selina Alko has created multimedia paintings for children's books, portraits for magazines, and editorial art for newspapers. She is an illustrator of the dynamic New York City-themed children's books My Subway Ride and My Taxi Ride. Selina lives in Brooklyn, N. Y. with her husband, artist Sean Qualls (CK notes: illustrator of the marvelous AALB book Dizzy), and their (CK notes: cute-as-a-button) son Isaiah." 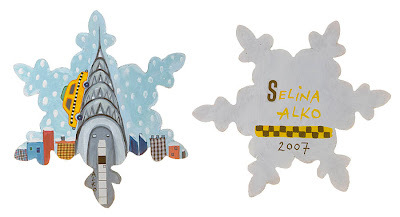 Selina's delightful snowflake is called "Snow Taxi," and it features one of our indomitable NYC taxicabs driving up the side of the Chrysler Building on a snowy day. It will be part of the third round of "Robert's Snow" auctions, starting December 3, and can be bid on here. So all together: FIGHT CANCER! BUY SNOWFLAKES! YEAH! Older PostDiscount Theatre Tickets: "A Feminine Ending"